Originally I gave this film a positive review, but after seeing it again recently I have to withdraw that praise: this film has major story problems. First off, the story is told in the clumsiest manner possible. I actually don't mind the aliens storyline, but it seems like Spielberg totally forget the techniques he used to such great effect on Jaws and Close Encounters and many of his most succesful films. In those movies he had a fantastic monster/visual to reveal, and he built suspense accordingly by *not* showing it to you until the end of the film. Here, we see the aliens in the first ten minutes. Where is the suspense, or sense of mystery and anticipation? What are we supposed to look forward to in this film? It is never clear until the end, and even then it doesn't make a lot of sense. Of course the 50's sci-fi B movies didn't make a lot of sense either, but Indy should be imitating the spirit of those films, not their actual ineptitude. I would have liked to have seen a structure where you have some teaser shots of the mothership early on, or the aliens, or perhaps the skull and a brief teaser scene of it's powers in action (I'm still not clear on exactly what the skull does or means) and then gradually weave the ship/aliens/skull in over the course of the story - or at least attempt a story structure that played up a sense of mystery and danger, like Independence Day, or the X-Files, or any other competent big-budget aliens-related film. Which, if they'd really gone over the top with it and made a flat-out exploitation film here, might have been kind of fun, or at least would have been an approach more in keeping with the B-movie aspects of the films that supposedly inspired this one. Instead, we get a story approach that involves corny Hardy Boys type interactions and pointless, cartoonish graveyard stumbling which you've seen a thousand times before. It kind of makes sense for the target family audience, and the actors are likeable enough to make the material feel less boring and shopworn than it actually is, but to mature audiences in search of thrills and chills it is pretty tame stuff. I think it is also pretty clear from the press and the interviews leading up to Indy 4's release that Spielberg didn't want this film to be made: in essence he was coerced. He is professional enough not to say who or how, but if you saw the interviews he did he was practically drawing a diagram: I thought the Last Crusade was it, I designed a closing shot to signal that, Harrison got the ball rolling, I was against the aliens idea, etc. I think it is obvious that he was voted down by Lucas and Ford - who recorgnized the opportunity for a big payday while no one was looking. Also, it is sad but true that during times of war, economic uncertainty, political change, or general distress, Americans have demonstrated that their solace-of-choice is the movies. If you have a franchise like Indiana Jones - one that is loved and appreciated as almost any franchise in film - you know that, under these types of conditions, you don't necessarily have to have a great movie up your sleeve in order to get people into the theaters. And the proof is in the pudding: Indy 4 was the third highest grossing film of 08 - behind The Dark Knight and Iron Man - doing roughly 320 million domestic (worldwide it was an unmitigated bonanza). And, without naming names, there are few people who understand timing and market forces like George Lucas. "Fans are clinging, complaining dip***** who will never ever be grateful for any concession you make. The moment you shut out their shrilled tremulous voices the happier you'll be for it." This is true for the unfortunate who actually think that this movie is so terrible that it should have never been made. These same fans were the ones who hated the prequel star wars trilogy. I'll admit that when I first saw this movie in theaters I had the same feeling of dissatisfaction that I felt when I watched the star wars prequels, which I thought had horrible acting. However I never hated any of these movies but was grateful that the same people who made the originals were willing to put out the hard work to make more of what I liked. Although, I recently watched the entire star wars saga with my girlfriend (who hasn't seen any of them) and found that I enjoyed watching the prequel trilogy a lot more than I did the first time around. When watching these films together for the first time, I was extremely shocked to find that the original trilogy had just as horrible acting as the prequel trilogy did, which is something I couldn't notice as a kid. My girlfriend actually liked the prequel trilogy the most (which still drives me crazy). When I watched Indy 4 for the second time along with the first three in the series, it was a similar feeling. I realized that Indy 4 is just as ridiculous, unrealistic, and fun as the first 3 in the series. It really isn't that much different. 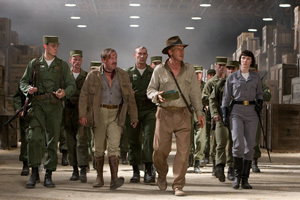 The story is the same, in that Indy tries to find an ancient artifact before its power falls in the hands of evil-doers. The only disappointment is that it seems as though Lucas has been adding more and more cartoony elements in his films over time. While they existed in his previous films (R2D2, C3P0) its gotten worse (Jar Jar Binks, the stupid prairie dog in the beginning of this movie, and the dumb vine swinging scene). This film has a lot of those elements but it doesn't ruin the movie. The best part about this movie is how good Harrison Ford still is and I was surprised to see that. 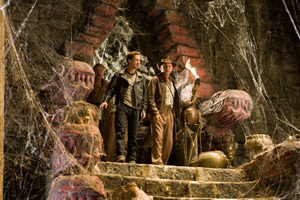 Raiders and Last Crusade it isn't, but Crystal Skull is at least better than the gross-me-out-Aztec-style bloodfest that is Temple of Doom, and if you don't get your hopes up too high or take it too seriously, it's fine Indiana Jones fodder. This movie has grown on me since I saw it in the theater. Yes, it could have and should have been better, but I enjoyed the humorous nods to the previous movies, I wanted closure between Indy and Marion, it was kind of interesting to find out what Jones has been doing in the intervening years, Shia is cute, and if you watch this movie with the mindset of a kid seeing Indiana Jones for the first time, it is a satisfying experience. It's definitely a little more Sci-Fi than the previous ones, but the Indiana Jones movies are classified as Sci Fi, and if you know anything about 1950s genre movies (and the movie is set in the 1950's), wacky alternative historical theories (like astronauts in Mayan glyphs), you remember the Cold War, Atom Bomb fears, and McCarthyism, (and you enjoy sight gags with furry little animals), then alot of the action and plot-line makes sense and is just plain fun. Remember Indiana Jones and the Raiders of the Lost Ark? The WWII Nazis are now McCarthy era Soviets, and the Ark of the Covenant is now an alien skull. No other changes, except . . .
Harrison Ford has aged, and forgotten how to act. The witty one liners are now tired. This is like a B-Movie with a gold-plated budget. Like getting kicked in the stomach. I loved the 1st three, and was excited to find out that they were making a 4th. I do not want to give any of it away for those that haven't seen it, but it is nice to know the producers/director reprized or mentioned past characters that are familiar. This movie took everything that made the other films great and threw them out the window. 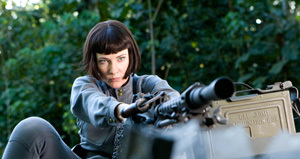 There is a reason this movie was named Worst Movie of the Year by film critics. Even Worse Than The Temple of Doom! I really really wanted to like this movie, but it is a travesty on many levels. The whole thing seems like a retread, and the script is filled with cliches and nonsense (yes, I do think I could have done a better job). pretty good after all this time... give it a chance... not as bad as all the reviews. 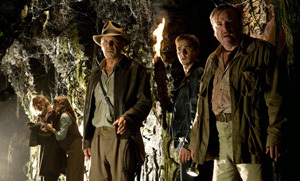 Despite the fact that there are many, many moments in the movie that will have you saying, "Yeah, right", "Indiana Jones and the Kingdom of the Crystal Skull" is still a fun movie. The action is great and sometimes comical. The story is solid. And the cinematography is top notch. True fans of the franchise will enjoy the story, the time period, and the adventure. The finish is a bit of a suprise, but still works. 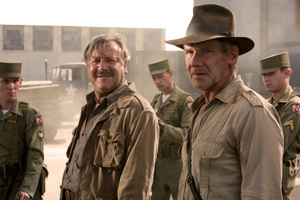 Indy 4: A great and entertaining film troubled by nothing more than un-meetable expectations. 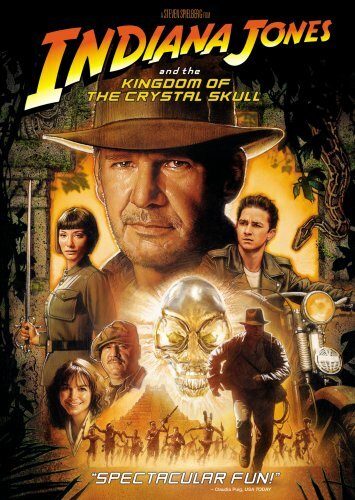 Let me first say that "Indiana Jones and the Kingdom of the Crystal Skull "is not a perfect film. It's not the genre defining film "Raiders of the Lost Ark" was back in 1981. But, simply put... it doesn't have to be. I've rarely seen a more fun and exciting film that has been criticized for such petty things. It's been called by some an over-the-top and impossible film. You know what...They're absolutely right! And that's exactly what makes it so great to watch. For 27 years, the Indiana Jones series has always been pushing the limits of what an adventure movie can be. So, if you're someone who's not a fan of cliffhanging adventure with highly improbable set-pieces and doses of the supernatural, then this film is not for you. But if being highly entertained for two hours by watching everyone's favorite archeologist get himself in and out of every mess conceivable, sounds like fun, then this film is right up your alley. There's little need to recap the plot. We have Indy and co. chasing and protecting the mystical Crystal Skull of Akator while dodging numerous bad guys along the way. Set pieces abound throughout in classic Indy fashion all framed by the one and only Steven Spielberg who, despite reports to the contrary, deeply cares about this film, and as much as anyone wanted to make it work. And work it does. There's terrific chases through warehouses, college campuses and dense Amazonian jungles. All set to a rousing score by the master, John Williams. And in the end, it's Harrison Ford, who even at 65, manages to get around better than most 30 year olds. Also, please keep in mind, that the film is set in the 1950s, and Lucas specifically wanted the film to reflect the sci-fi flavor of the era, so things do get a bit more fantastical than in previous films. But it's nice to know that after all these years, everyone involved still wants to go for broke. And I love that. So if you can set aside years of expectations and simply watch the film as it was intended, then I know you'll have a great time. And in the end that's all this film was ever created to do. Unfortunately, it does seem true that more and more audience members today want realism, grittiness and logic and cannot seem to just let that go and simply have fun. Kind of a shame. Lots to enjoy here in a big, big movie. You get Indy, interdimensional beings, the 50's, and more in this action adventure multi genre thrill ride. Ford was great as the older Jones, and gave a lot to enrich the character in often subtle ways. 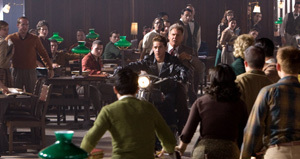 The rest of the cast was great as well and the crew did a top notch job putting the film together. The 2 disc blu ray version has tons of special features and delivers an awesome hi def experience. Cant wait to see the first 3 on blu ray. If you liked previous Indy movies check this one out. At the very least rent it.